Ethnolects and ethnolectal variation are new topics in research on bilingualism and language contact. In Europe, and certainly in the Netherlands, so far much ethnolectal research has been either ethnographically oriented, with an interpretive approach, or more descriptive in aiming at an inventory of features observed in certain ethnolects or ethnic styles. Before 2005, systematic research with linguistic depth of analysis was lacking. 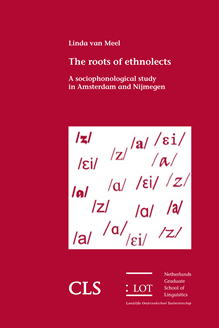 To resolve this, a project was set up in the Netherlands to investigate the origin, position, and social spread of features of modern Dutch ethnolects systematically: ‘The Roots of Ethnolects, an Experimental Comparative Study’. It is based on fieldwork data collected in Amsterdam and Nijmegen with speakers of Moroccan-Dutch, Turkish-Dutch and ‘white’ Dutch backgrounds. This dissertation is part of this project and examines seven research questions using natural speech data. Four questions address the origins of certain variation patterns. Another research question focuses on style shifting and the last two deal with the social diffusion of patterns of variation. In this thesis, the variation in the realization of the phonemes /z/, /εi/, /a:/ and /ɑ/, as well as the contrast between the latter two was analyzed. The phonemes were chosen to represent three different kinds of roots: substrate, regional, and second language acquisition. Also, the co-variation between 17 linguistic variables was studied. The various studies provide new insights in the systematic nature of ethnolectal varieties, from both a linguistic and a social point of view, especially with respect to sociophonological aspects.